None of operators in Cape Verde provide disaggregated revenue data. However, the National Communications Agency (ANAC), does provide traffic data for the market. 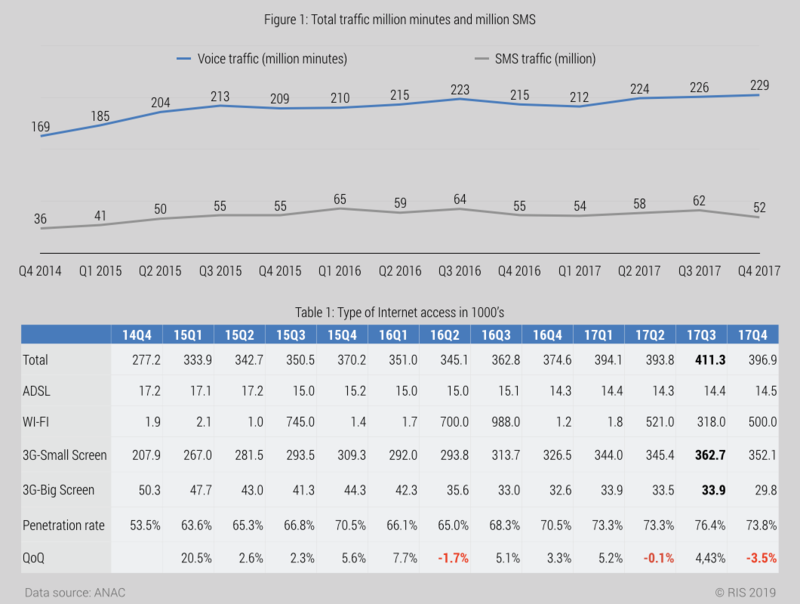 Voice traffic increased from 2015 to the end of 2017, while SMS traffic has stayed steady (see Figure 1). Internet penetration has steadily increased and seems to have reached a saturation point at around 73% penetration. The steady increase in mobile internet use and the increase in voice traffic is inconsistent with the hypothesis that OTT apps have a negative impact on Cape Verde’s MNO revenues. There is very little data available for Cape Verde. However, SMS and voice traffic has remained steady, indicating that OTT apps have not had a negative impact on the market.